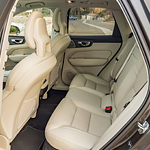 The Volvo XC60 R-Design’s interior is equipped with numerous elements that contribute to the comfort and convenience of the driver and passengers. Well-constructed seating, a carefully configured front console and a large center display screen are just a few of the things that will welcome you into the R-Design’s passenger cabin. On the outside, the R-Design is designed to turn heads. Black trim, an imposing front grille and dual tailpipes that are mounted flush with the rear bumper all contribute to an appealing exterior package that’s sure to please even the most style-conscious driver.